According to the New York Times, president Obama has "significantly lowered" the bar on how success in Afghanistan is defined. "The goal is to have an Afghanistan again that has a degree of stability such that forces like Al Qaeda and associated groups cannot have safe haven unimpeded, which could threaten the region and threaten U.S. and other interests in the world." "When the president and a half-dozen White House aides began to plan for the withdrawal, the generals were cut out entirely. There was no debate, and there were no leaks." If Obama doesn't care "whether the Afghan military can secure the country or not," why wait until 2013? Is it because of the presidential election? Perhaps Obama doesn't want to run for reelection in the middle of his Afghan retreat. As Obama explained to the Russians at the UN he'll have more flexibility after the election. Obama's position on Afghanistan changes, or evolves, even more quickly than his position on gay marriage. In 2008, Presidential candidate Obama said "This is a war that we have to win." (Sen. Barack Obama, Remarks of Senator Barack Obama: A New Strategy for a New World, Washington, D.C., 7/15/08). "As I said when I announced this strategy, there will be more difficult days ahead. The insurgency in Afghanistan didn't just happen overnight, and we won't defeat it overnight. This will not be quick, nor easy. But we must never forget: This is not a war of choice. This is a war of necessity. Those who attacked America on 9/11 are plotting to do so again. If left unchecked, the Taliban insurgency will mean an even larger safe haven from which Al Qaida would plot to kill more Americans. So this is not only a war worth fighting; this is a -- this is fundamental to the defense of our people." And while President Obama ignored military commanders in planning his Afghan retreat, presidential candidate Obama promised to act with "proper regard" to the advice of military commanders. Nevertheless, Obama has decided to declare victory and retreat from Afghanistan regardless of whether the Afghan military can secure the country or not. I can't decide which is more infuriating, that the biased media wing of the Democrat party gives Obama a pass on such outrageous inconsistency, or that Obama always tries to be on both sides of so many issues. Just how stupid does the JournolLst crowd think the American people are? Like Obama has done with issue after issue, his "new strategy" for the War in Afghanistan tries to have it both ways. Obama's strategy is a Bush-like surge, but with a timetable for ending, not winning the war. I remain an unrepentant supporter of the war against terror the Islamic extremists have forced upon us, but I find it very hard to support Obama's Afghan "new strategy" because of his misguided artificial withdrawal date. As I have written before, a war our leaders are not willing to fight to win, is not a war we should fight. Also posted at Right Side Politics (Examiner). It really doesn't matter how President Obama divides the Afghan baby, how he splits the difference between McChrystal and Biden. Because the war in Afghanistan has been lost. I remain an unrepentant of the war. But if Obama does not give the commander he selected the resources he needs to win the war then I may have to reconsider. No Obama Afghan troop decision until Thanksgiving? It has now been 66 days since General Stanley A. McChrystal's report, in which he requests more troops, was issued at the end of August. Unable to make a decision for months, President Obama continues to indecisively dither about whether to send more troops to Afghanistan to fight what he correctly calls a "war of necessity." Too busy golfing to decide. Too busy trying to save the failing Deeds and Corzine gubernatorial campaigns to decide. Too busy fund raising to decide. On NBC Nightly News, Chuck Todd reports the long delayed Obama decision on Afghan troops may not come until Thanksgiving. It is time for Obama to man up and make his decision. Add George Will to those calling for a new strategy for Obama's war in Afghanistan and Pakistan. In a column entitled "Time to Get Out of Afghanistan," Will expands upon comments he made on ABC's "This Week" and argues we should reduce our forces in Afghanistan and "do only what can be done from offshore, using intelligence, drones, cruise missiles, airstrikes and small, potent Special Forces units, concentrating on the porous 1,500-mile border with Pakistan, a nation that actually matters." The Will strategy comes a day after General Stanley McChrystal, the top US commander in Afghanistan, submitted a report that also calls for a new strategy in Afghanistan. According to the New York Times, McChrystal's report lays the groundwork for more troops and "would invest the United States more extensively in Afghanistan." President Obama announced a new strategy for his war in Afghanistan and Pakistan at the end of March - less than six months ago. Can Obama sell another new, more intensive, Afghan strategy, while his leave Iraq by date certain policy continues to move closer to snatching defeat from the jaws of victory in that theater of the struggle formerly known as the Global War On Terror? Can Obama muster the public support or maintain Bush-like steadfastness absent public support? Last month a CNN/Opinion Research Corp. poll found a majority, 54%, now oppose the war in Afghanistan. That percentage is sure to rise as the numbers of U.S. troops killed in Afghanistan continue to rise. Antiwar groups have now turned against Obama's war and plan an autumn campaign against Obama. How much longer will the Afghan war remain the Obama policy that Republicans like the most? How much longer will Republicans support Obama's war when they think about how wrong Obama was about the Iraq surge. Obama was among those who stridently opposed the surge and predicted its failure. When even Obama realized he was wrong about the surge, team Obama engaged in a silly effort to hide the evidence by erasing his criticism of the surge from the web. How much longer will unrepentant supporters of the Global War On Terror like me continue to support Obama's war when Obama continues to back away from war on terror, insists on closing the terrorist detention facility at Guantanamo Bay without a clue as to where he will put the terrorists, gives the green light to political show trials of Bush administration officials and allows his government to investigate CIA operatives? How much longer will you support Obama's war? Al Qaeda and the Taliban don't think it will be long enough for us to win. President Obama announced a new strategy for his war in Afghanistan and Pakistan on Friday. You can read the White Paper for Obama's strategy for his war in Afghanistan and Pakistan below. At the Telegraph, Nile Gardiner gives President Bush his due for the global war against Islamist terror. Today the world is witnessing the birth of the first truly democratic state in the Middle East outside of Israel. More than eight million voted in Iraq's parliamentary elections in 2005, and the region's first free Muslim society may become a reality. The success of the surge in Iraq will go down in history as a turning point in the war against al-Qaeda. The stunning defeat of the insurgency was a major blow both militarily and psychologically for the terror network. There has not been a single terrorist attack on U.S. soil since 9/11, and for all the global condemnation of pre-emptive strikes, Guantanamo and the use of rendition against terror suspects, the fact remains that Bush's aggressive strategy actually worked. There have been no successful terrorist attacks in Europe since the July 2005 London bombings, in large part due to the cooperation between U.S., British and other Western intelligence agencies. The decision by Bush, with Blair's support, to sweep the Taliban out of Afghanistan was a brilliant move, one that not all U.S. presidents would have taken. A weaker leader would have gone to the United Nations Security Council and sought a negotiated settlement with Kabul. It was a risky gambit that was vindicated by a stunning military victory in the space of a month, with a small number of U.S. ground forces involved. Bush succeeded in building a 41-nation NATO-led coalition to support Afghanistan. The notion that the resurgence of the Taliban is America's failure is nonsense. The U.S. has more than 30,000 troops in the country under U.S. or NATO command, making up over half of all Allied forces there. Continental European allies have simply failed to step up to the plate with more troops. President Bush also recognized the importance of reshaping the NATO alliance for the 21st Century, backing an ambitious program of NATO expansion, culminating in the addition of seven new members in 2004. He also had the foresight to support the development of a missile defense system in Europe. Much of the left's relentless criticism of the President is driven by personal animosity without any rational analysis of his achievements. I have my quibbles with President Bush, but I will always be grateful for his steadfast leadership in the war and the fact that his administration managed to keep the terrorists from attacking the U.S. for the more than seven years since 9/11. Bush said this reduction "will relieve the burden on our forces and it will make life easier for our wonderful military families." Bush said terrorists "are on the run" and that generally improved security likely will permit further U.S. troop reductions. The Washington Post reports that the "leader of the Sunni insurgent group al-Qaeda in Iraq and several of his top lieutenants have left Iraq for Afghanistan." The CBS Evening News reported "more encouraging news about the drop in violence" in Iraq. The US death toll "this month is nine -- the lowest since the invasion in 2003. The New York Times reports Iraq and the US are close to a deal on a long-term security arrangement. The agreement will set the terms for the presence of American troops in Iraq. The Financial Times reports, "Iraqi oil production has risen to its highest level since the 2003 invasion on the back of improved security across the country." Iraq pumped an average of 2.43m bpd between April and June. If Obama had his way, U.S. troops would have been out of Iraq in March 2008, and there would have been no surge which made all this progress possible. No wonder the Obama scrubbed his website to remove his criticism of the surge. A new Rasmussen poll finds voters who have served in the U.S. military favor McCain over Obama, 56% to 37%. Another Rasmussen survey found 63% of Americans do not believe Obama's trip to Afghanistan and Iraq made the antiwar Democratic any more qualified to be president. Less than a third of respondents, (32%), thought Obama learned from his trip to Iraq, and 40% said Obama's mind was already made up about how to deal with the war there. 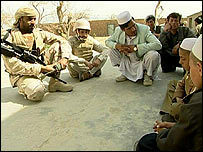 Muslim troops from the United Arab Emirates (UAE), an Arab country, have been operating in Afghanistan as part of the United States-led coalition for five years. Their role is mainly humanitarian, but the Emirati troops have been involved in full-scale military operations -- taking part in dangerous missions alongside US troops and, on occasion, fighting their way out of Taleban ambushes. We try to convince the people about the US, about British. They came here to give you peace. "At first I thought these were American soldiers and I wanted them to leave but when they said they were Muslims I knew they were our brothers," a young Afghan man says. The Emiratis are not the only Arab troops working with the Afghan coalition. Jordanian forces have been carrying out some base security duties. The fact that an Arab Muslim army has been operating alongside Americans in Afghanistan for five years is a surprise. Until now, the Emirati deployment has been kept so secret that not even their own countrymen knew they were here. I'm glad the cat is out of the bag. Maybe we will see more Muslim assistance in the struggle against Islamic extremists.